Thasos ConsumerStreams DataFeed offers daily customer visitation for retailers, restaurants, hotels, theme parks, and other consumer-facing companies. Thasos ConsumerStreams DataFeed offers customer visitation details for retailers, restaurants, hotels, theme parks, and other consumer-facing companies. Using Thasos data, subscribers can identify and evaluate investment opportunities before they are priced into the broader market, and cross-validate other sources of data and fundamental information. Thasos is an alternative data intelligence platform that transforms location information from mobile phones worldwide into real-time foot traffic and demographic analytics for points of interest. The product information and content statistics contained in this document are as of January 2019. Thasos ConsumerStreams DataFeed covers over 120 publicly listed consumer companies with daily foot traffic data from their U.S. locations, with historical data available from 2015 for time series analysis. 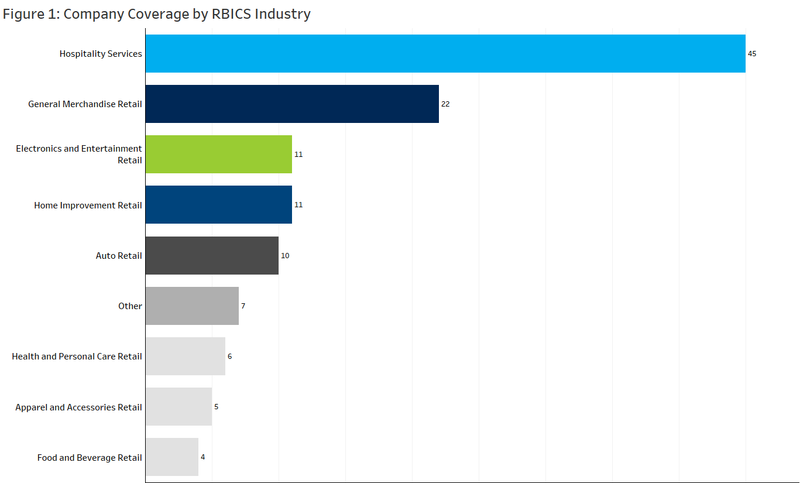 The DataFeed also covers individual brands within a parent company (see Fig 2 for examples). Thasos uses the latest advances in artificial intelligence, machine learning and distributed computing to turn billions of daily location events into information that can be easily consumed, understood, and acted upon by investors and business managers. Three+ years of cleaned and normalized data and highest level compliance to privacy standards is what truly sets Thasos apart. Collecting and processing location events is a complex and computationally intensive process that Thasos has been perfecting for over seven years. In the collection phase, data sources are systematically analyzed and vetted to avoid or correct for demographic and geographic biases as much as possible. Less than 1% of the sources of geolocation data evaluated by Thasos meet such standards. Proprietary unsupervised machine learning models are used to normalize the data and minimize noise from each data source. The data from each independent source is combined to maximize the panel size while maintaining time-consistency of the aggregated data. Meeting (and exceeding) demands of current regulatory environment, Thasos pays highest attention to compliance and data security. No personal identifiable information (PII) is received by Thasos from any data sources. All data providers must comply with Thasos’ privacy policies and terms of service and all applicable regulations (including GDPR). In addition, data providers must require affirmative opt-in from their users and clearly disclose how anonymized data could be used and shared with third parties. To map location data to a specific retailer, Thasos employs geofencing. A geofence is a virtual perimeter for a real-world geographic location—examples include a restaurant, a theme park, or an anchor tenant at a mall. Thasos’ precise geofences, which are created by a team of experienced analysts, are consistently verified and updated to ensure accuracy. Even with rapid growth in online shopping in recent years, almost 90% of US retail sales are still brick-and-mortar. Monitoring changes in Thasos’ foot traffic data over time can be used to forecast companies’ reported sales volumes. To be able to deliver foot traffic data in a clean, consumable matter, Thasos adjusts for noise, bias and time inconsistency. Only with these adjustments in place can relevant KPIs, such as same store sales, be derived by end users. To create a KPI with the Thasos DataFeed that will be comparable to a company’s reported financials, the first step is to convert Thasos’ daily data points to a quarterly value. For example, by averaging the daily footfall data points within a company’s most recent fiscal quarter and previous quarter and calculating the percent change. The previously reported sales value can then be multiplied by this percent to create a predicted sales value. A subscriber can validate this KPI prediction by running a regression against FactSet Estimates’ (FE) Actual Sales values. Figure 3 shows that the highest covered RBICS Industry within the Thasos universe, Hospitality Services, has a correlation of 67% between predicted sales and actual sales. The Thasos KPI is locked in within a week of a company’s fiscal period end, allowing for the earliest possible data-driven surprise predictions. With this predicted sales value, a logical next step is to check the predictive power against analysts’ sales estimates to understand how well the KPI can project the direction of earnings surprise. Surprise direction is being gauged by comparing a company’s actual sales value with the final mean consensus value available before a company reports earnings. 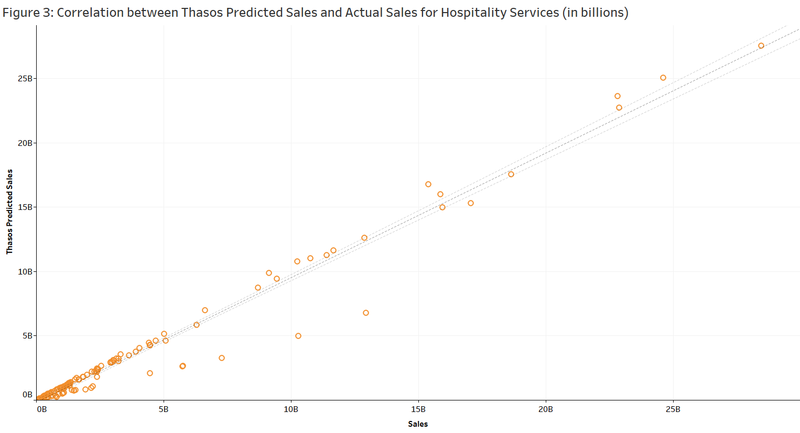 With surprise direction identified for each event, the focus shifts to finding the percent difference between the Thasos predicted sales KPI and the corresponding mean consensus value at the fiscal period end date. 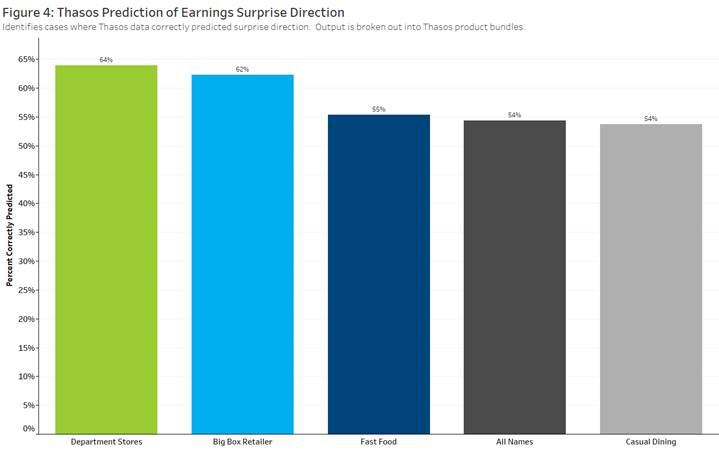 Cases where the Thasos predicted sales number is above the mean are predictions for positive earnings surprise while those below the mean forecast negative surprise. The Thasos ConsumerStreams product is available as a set of all 129 covered companies or as five separate packages bundled by industry. The chart demonstrates the accuracy of predicting surprise direction, broken out by category. Only those bundles with 50 or more observations were included in the analysis. It is important to note that the Thasos KPI is locked in within a week of a company’s fiscal period end, while the street will continue to adjust estimates up until the last day before a company reports. This allows for accurate surprise predictions immediately after the fiscal period end date, giving an edge while the street estimates play catch-up. With the highest quality data sources and best-in-class data processing techniques, Thasos’ ConsumerStreams DataFeed makes rigorous quantitative analysis of foot traffic patterns to identify trends and make informed forecasts possible. For more information on Thasos’ data, including case studies, white papers, and additional research, please visit its provider page on the Open:FactSet Marketplace. If you have any questions, please contact us at OFSupport@factset.com.